22/05/15 -- Soycomplex: Beans closed lower on the day, and for the week, setting fresh contract lows. Midwest weather forecasts lean warm and wet, offering little in the way of threat. The USDA reported 109,400 MT of new crop soymeal sold to Thailand under the daily reporting system today. The US are on holiday on Monday for Memorial Day, so the regular weekly crop progress report from the USDA is delayed until Tuesday. The trade is expecting US soybean plantings to have reached 55-60% done. Beans look like they are lining up to test the September front month low around the $9.10 area, before possibly staging a push below $9/bushel. "A minor correction to the upside in soybeans isn’t out of the question. Sustaining a rally, absent a weather scare, seems impossible at this point," said Benson Quinn. Rabobank forecast soybean prices at $8.90 in Q4 of 2015 and $8.80 in Q1 of 2016. The USDA's forecast of a 2015 US soybean area of 84.6 million acres could be exceeded given the strong early pace of plantings, they said. They suggest that the final planted area could be 1 million acres more than this, which is exactly the number quoted by Lanworth earlier in the week. Yields however might only average 45 bu/acre, which is a bushel less than the USDA estimated earlier in the month, say Robobank. They see meal prices at $295 in Q4 of this year, before gradually rising in the first half of 2016. The commitment of traders report shows fund money sitting on a record soybean short of over 90k contracts as of Tuesday night, and they are thought likely to have extended that position since, having been an estimated net seller of around 8,000 lots today alone. Jul 15 Soybeans closed at $9.24 1/4, down 14 1/4 cents; Nov 15 Soybeans closed at $9.07, down 11 1/2 cents; Jul 15 Soybean Meal closed at $304.20, up $0.10; Jul 15 Soybean Oil closed at 31.64, down 61 points. For the week that puts front month beans 29 cents lower, with meal up 90 cents and oil down 143 points. 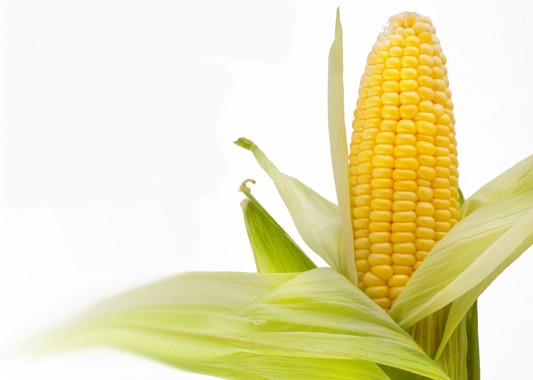 Corn: The corn market closed around 4-5 cents lower on the day and for the week. "A private but respected analyst pumped his new crop domestic estimate to 170 bushels per acre citing the emergence of El Nino," said Benson Quinn. The USDA were at 166.8 bu/acre earlier in the month. Rabobank are neutral to slightly bullish on corn, forecasting prices at $3.80/bushel at the end of the year, rising modestly to $3.90 in Q1 and $4.00 in Q2 of 2016. That's about where the market forward prices are already. They see US plantings this year at 89.2 million acres, a bit less than Lanworth's 89.5 million estimate, and exactly in line with the USDA. They currently only project US yields at a conservative 163 bu/acre, but concede that if the weather co-operates and anything above the USDA's 166.8 bu/acre estimate is achieved, then prices could fall below $3.50/bushel. The USDA will report on corn planting progress on Tuesday, with a figure somewhere in the low 90's expected. They are also likely to give us their first corn crop ratings of the season, with expectations being that a high, possibly record high, proportion of the crop to be in good to excellent condition. Tonight's closes put the new crop soybean:corn price ratio at 2.40:1 versus 2.43:1 a week ago. Russia reported corn plantings there at 84.5% complete on 2.4 million hectares. Ukraine's corn planting is now just about finished. Reuters report that China imported 605,438 MT of DDGs in April, the largest volume since September 2014, and more than double the amount shipped in during March. "We expect monthly imports would stay at about this level until September," Shanghai-based JC Intelligence said. CNGOIC report that China only imported 140,837 MT of corn last month. with Ukraine (around 94,800 MT) and Russia (37,800 MT) the largest suppliers. They are also importing large volumes of sorghum as a corn replacement too. Jul 15 Corn closed at $3.60, down 5 cents; Sep 15 Corn closed at $3.66 3/4, down 4 3/4 cents. For the week Jul 15 was 5 1/2 cents easier. Wheat: The wheat market closed lower on the day but higher for the week. US weather forecasts on the Plains are now less wet than they were for next week. Whilst US wheat exports struggle, Europe's are flying with another 647 TMT worth of soft wheat export licences granted this week, taking the season to date total to 29.1 MMT, more than 12% ahead of last season's record pace. EU barley exports meanwhile are more than 50% ahead of where they were this time a year ago at a cumulative 8.4 MMT. The USDA did however report the sale of 101,950 MT of US wheat for delivery to Taiwan during the 2015/16 marketing year under the daily reporting system today. Rabobank said the the current US wet weather concerns are unlikely to provide the wheat market with long-term support. "The fundamental situation has not changed, 2014/15 US wheat stocks will be big, given the sluggish export pace, and 2015/16 stocks are forecast to build further," they said. They forecast Chicago wheat prices at $5.20/bushel in Q4 of this year, rising modestly to $5.30/bushel in Q1 and Q2 of 2016. Both are below the levels where the market is currently at. They see Russia's 2015/16 wheat crop at 54-55 MMT and exports at more than 20 MMT. They see production in Ukraine at 22-23 MMT and exports at around 11 MMT. Strong competition once more from the Black Sea region will trim EU exports back to around 30 MMT next season, they predict. Production in Europe is estimated at 149 MMT. The Buenos Aires Grain Exchange forecast Argentine wheat plantings at 4.1 million hectares this year, a decline of around 7% on last year. As expected tonight's commitment of traders report shows fund money exiting some of their hefty short bets on wheat for the week through to Tuesday. Sep 15 CBOT Wheat closed at $5.23, down 6 1/2 cents; Sep 15 KCBT Wheat closed at $5.57, down 10 3/4 cents; Sep 15 MGEX Wheat closed at $5.80, down 9 1/4 cents. For the week, CBOT wheat was up 12 cents, with KCBT 15 1/4 cents higher and MGEX adding 18 3/4 cents. At the finish, May 15 London wheat was unchanged at GBP111.20/tonne, Sep 15 Paris wheat ended EUR2.50/tonne lower at EUR182.50/tonne, Jun 15 Paris corn fell EUR0.25/tonne to EUR154.25/tonne whilst Aug 15 Paris rapeseed was down EUR0.50/tonne to close at EUR359.00/tonne. For the week though, nearby London wheat added GBP3.10/tonne, and in Paris wheat gained EUR8.00/tonne, corn was half a euro lower and rapeseed advanced EUR5.25/tonne. The old crop/new crop spread on London wheat narrowed a little, down from GBP11.90/tonne a week ago to GBP11.25/tonne tonight, but that's still a pretty cavernous gap. EU exports continue to run at record levels, with Brussels issuing 647 TMT worth of soft wheat export licences this past week, taking the season to date total to 29.1 MMT, up more than 12% on this time a year ago. They also released 356 TMT worth of barley export licences, taking the season to date total to 8.4 MMT, a 58.5% hike compared with this time last year. The weak euro continues to help, with the pound closing the week above 1.40 versus the single currency. The outlook for further euro devaluation ahead, with Barclays this week predicting sterling to rise to 1.45 by the end of the year, should help exports, although competition from the Black Sea will be fierce as usual. The weak euro won't help shift the UK's large exportable surplus though. "A big crop, combined with low farm gate prices, has led to the situation where there is almost 60% more wheat forecast to be in commercial end season stocks than last year, according to the latest update from Defra," note the HGCA. As well as offering a large premium to carry old crop into new crop in the UK, it is also noteworthy that the market is tonight paying an additional GBP10.55/tonne to carry wheat from the 2015 harvest into 2016! That's 8.6%, compared to only a 4.1% premium in Paris. In their latest forecasts for the season ahead, Rabobank estimated Paris wheat prices at EUR185/tonne in the final quarter of the year, which is almost exactly where the market closed tonight. Strong Black Sea exports are expected, especially in the first half of 2015/16, as sellers there traditionally aggressively market their grain as early in the season as they can regardless of how good a production year they have had. Rabobank currently estimate Russia's wheat crop at 54-55 MMT, which combined with large carryover stocks should allow for exports of more than 20 MMT in 2015/16, they say. That's around the same volume as they have shipped out so far this season. The Ukraine wheat crop, estimated at 22-23 MMT, should allow for exports of around 11 MMT, they add. Again that's very similar levels to this season. Rabobank forecast an EU wheat crop 149 MMT this year, and think that exports in 2015/16 might fall around 10% to 30 MMT. In other news, Russian spring grain planting is around 61% complete on 19 million ha, say the Ag Ministry there. That's 2.8 million ha less than this time a year ago. Krasnodar, Stavropol and the Kursk region are finished planting, but the Volga (67% done), Siberia (43.6% complete) and the Urals (21.6% sown) are the areas that are lagging, they say. Heavy rain is being blamed for the delays, which is also the case across the border in Kazakhstan where it has been very wet indeed. Egypt have been less active than normal on the wheat import front. GASC say that they've already bought 4 MMT of new crop wheat on the domestic market, which exceeds the government target by 0.3 MMT. It's not surprising that they have done so well, the price they pay local farmers is the equivalent of around $367/tonne! Algeria have been more active internationally, they bought 450 TMT of what is believed to be mostly French wheat for August shipment today at prices said to be around $213-214/tonne C&F. Tunisia, another traditionally big buyer of French wheat, will also need to be more active, their 2015 grain harvest is estimated to be around 30-50% lower due to lack of rain. The French still look likely to be on target for a very good, and possibly record wheat crop this year. FranceAgriMer said today that 91% of the French wheat crop was in good to very good condition, unchanged on a week ago and far better than 76% this time last year. Winter barley rated good to very good was 90%, the same as last week and 17 points better than a year ago. Newly planted corn was also rated 90% good to very good. They said that 58% of French wheat was headed versus 26% a week ago, but still a little retarded compared to 67% a year ago. Winter barley is now 100% headed. Corn is 98% planted and 89% emerged, they added. 21/05/15 -- Soycomplex: Beans continue to grind a little lower on good planting progress and a non-threatening Midwest weather forecast. Weekly export sales were OK on old crop at 165,500 MT but a disappointment on new crop (again) at only 77,500 MT. Expectations had been for sales of 150,000–350,000 MT on new crop beans, according to Benson Quinn yesterday. 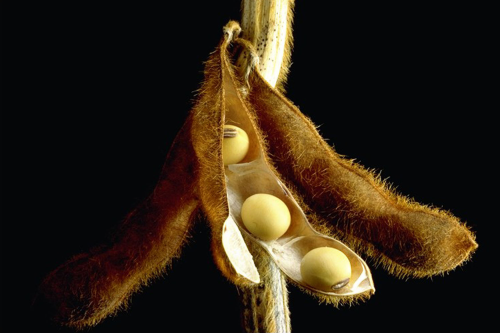 The Buenos Aires Grain Exchange said that the Argentine soybean harvest had now reached 87.5% complete, up 8 points on the week and 17.6 points ahead of this time last year. They left their production estimate unchanged at a record 60 MMT. Brazil's Agroconsult raised their forecast for this year's Brazilian crop from 95.8 MMT to a new record 96.1 MMT. The USDA are currently only at 94.5 MMT. Celeres estimate the Brazilian crop at 94.7 MMT. MDA CropCast were unchanged on their forecast for the world soybean crop in 2015/16 at 302.7 MMT, and also held steady on US production prospects at 3.823 billion bushels versus the USDA's 3.85 billion estimate. Lanworth estimated the 2015 US soybean area at 85.6 million acres, which is 1 million above the USDA. Brazil, China and Peru are said to have agreed to a feasibility study to construct a "mega railroad" from Porto do Açu, a Brazilian Atlantic port near Santos, to Peru’s Puerto Ilo on the Pacific Ocean - a distance of around 3,300 miles. The aim is to reduce shipping costs of soybeans and other goods to China. It will doubtless meet with conservation and other issues/objections. The project is estimated to cost $10 billion, and would take 6 years to construct, officials say. A Bloomberg survey of traders and analysts across the globe found only two that were bullish on soybean price prospects, 21 were bearish and 11 neutral. Jul 15 Soybeans closed at $9.38 1/2, down 2 3/4 cents; Nov 15 Soybeans closed at $9.18 1/2, down 1 1/4 cents; Jul 15 Soybean Meal closed at $304.10, down $0.40; Jul 15 Soybean Oil closed at 32.25, up 5 points. Corn: The corn market closed around 5 cents higher. Weekly export sales of 812,600 MT for delivery in 2014/15 were up noticeably from the previous week and 12 percent above the prior 4-week average, said the USDA. They also reported new crop sales of 80,700 MT, including one cargo for China. Expectations had been 400,000–600,000 MT on old crop, and 50,000–200,000 MT new crop, so these numbers were supportive. Private exporters also reported a sale to unknown destinations under the daily reporting system of 152,400 MT for delivery in the 2014/15 crop year, and a further 50,800 MT for 2015/16 delivery, adding further help today. A firmer once more wheat market probably also helped today. Short covering and profit taking was noticeable on the day, said Benson Quinn. However "near perfect forecasts and a crop planting close to completion will continue to weight on this market moving forward. Expectations are for a record high crop condition rating next week," they added. The Buenos Aires Grain Exchange said that the Argentine corn harvest was now 35.5% done, and held steady with their estimate for a crop of 25 MMT. MDA CropCast were unchanged on their world corn production forecast in 2015/16 at 959.9 MMT, and pegged the US crop also unchanged from a week ago at 13.8 billion bushels. The USDA are currently at 13.63 billion. Lanworth estimated US corn plantings at 89.5 million acres, which is 300,000 more than the USDA. They said that China's 2015 corn crop "would not exceed 230 MMT" - which would be a record. The USDA are currently at 228 MMT (also a record). MDA CropCast are at 224.1 MMT. Ukraine said that it had planted 4.1 million hectares of corn so far, which is above some analysts estimates for the full planted area this year. CBGOIC said that China would import a record 9 MMT of sorghum this year, of which 7.4 MMT would come from the US. Sorghum imports last year were only 4.16 MMT, so that volume will more than double, they predict. Celeres estimated the Brazilian corn crop at just over 81 MMT versus the USDA's 78 MMT. A Bloomberg survey of traders and analysts found 9 that were bullish on corn's price prospects, 14 were bearish and 11 neutral. Jul 15 Corn closed at $3.65, up 5 cents; Dec 15 Corn closed at $3.82 1/4, up 5 cents. Wheat: The wheat market closed with good gains. Extreme wetness on the Plains, with the prospect of plenty more to come, has nervous shorts scurrying for the exits. We will find out just how short they still are, or at least were as of Tuesday night, with tomorrow's commitment of traders report. Dryness in western Canada and southern Russia is also starting to grab a few headlines. India is said to be buying Australian wheat to bring up the quality of their own rain/hail damaged crop. They could import the more wheat this year than they have since 2010, it is said. MDA CropCast lowered their forecast for the world wheat crop by 1.37 MMT to 712.3 MMT, which is 6.6 MMT below the USDA. The reason for the cut was China, who's crop was pared back to 127.5 MMT, some 2.5 MMT below the USDA. China can suffer some crop losses in an El Nino year. MDA CropCast estimated the US winter wheat crop at 1.567 billion bushels, with all wheat production at 2.216 billion. The USDA are only at 2.087 billion at the moment. Lanworth threw in a curveball with an estimate of 60.7 MMT for Russian wheat production this year, which is much higher than other trade estimates. The USDA are only at 53.5 MMT presently. Lanworth were also well above the USDA on Canada at 31.2 MMT and Ukraine at 23.2 MMT, although they were a bit lower on Europe at 150 MMT. Weekly US export sales came in at 74,400 MT on old crop, with just two weeks of the marketing year remaining. New crop sales were however pretty modest at only 128,200 MT. Actual shipments were 370,000 MT were up 24 percent from the previous week, but down 15 percent from the prior 4-week average. Cumulative season exports now stand at 21.44 MMT versus a USDA forecast of 23.2 MMT. The strong US dollar, and the outlook for that to continue in 2015/16 will make finding foreign sales a challenge for the US. A Bloomberg survey of traders and analysts found 17 that were bullish on wheat's price prospects, 11 were bearish and 6 were neutral. Jul 15 CBOT Wheat closed at $5.22, up 9 cents; Jul 15 KCBT Wheat closed at $5.57 3/4, up 12 3/4 cents; Jul 15 MGEX Wheat closed at $5.78 1/4, up 10 cents. 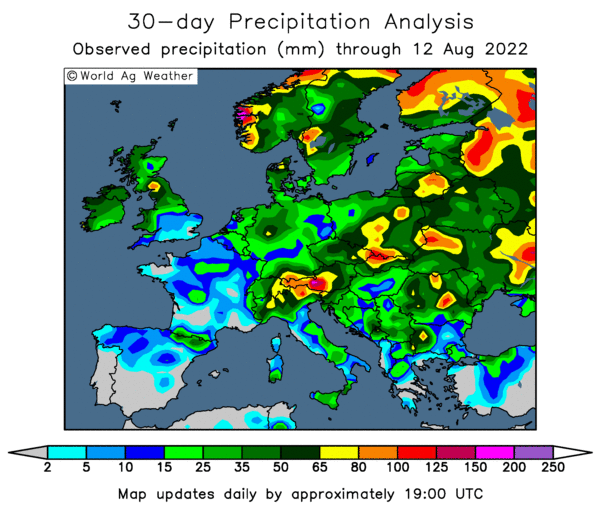 21/05/15 -- EU grains closed mostly higher, as US wheat futures rose anew as heavy rains of "biblical proportions" batter US winter wheat on the Plains immediately prior to harvesting. The day ended with May 15 London wheat up GBP1.50/tonne at GBP111.20/tonne, Sep 15 Paris wheat jumped EUR4.50/tonne higher to EUR185.00/tonne, Jun 15 Paris corn gained EUR0.50/tonne to EUR154.50/tonne whilst Aug 15 Paris rapeseed was down EUR0.25/tonne to close at EUR359.50/tonne. "The leading wheat district in the Texas panhandle has received 6.8 inches of rainfall in the past few weeks, more than 3 times the average," said Martell Crop Projections. There's now up to 10 inches of further rainfall in the forecast for the Texas/Oklahoma border area across the next 7 days, according to a report on Agrimoney. At home, the pound closed above 1.40 against the euro - a feat it has only managed to achieve a handful of times since late 2007. Barclays altered their forecasts for the outlook of sterling, although maintaining their view that it will go in opposite directions against the US dollar and the single currency over the next 12 months. Against the euro they now see the pound hitting 1.43 in the next quarter of 2015 (up from a previous forecast of only 1.38), before appreciating further to 1.45 in Q4 and 1.47 in Q1 of 2016. The UK currency will however fall to 1.43 versus the US dollar in Q3 of this year (although that's better than a previous forecast of 1.39), followed by 1.42 in Q4 and 1.40 in Q1 of 2016. If true, then this would obviously favour French wheat prices more than those in the UK, although both would likely fare better than those in the US, who's exports are already struggling. Concerns remain over the fortunes of Russian wheat too, with hot and dry weather in the forecast there and spring wheat planting less than halfway done. Lanworth don't appear to share those concerns though, estimating the Russian wheat crop at 60.7 MMT today - far higher than anything else in the ring. The USDA are currently only at 53.5 MMT, and some other analysts are lower than that. Lanworth are also more bullish on wheat production prospects in Canada (31.2 MMT versus the USDA's 29.0 MMT) and Ukraine (23.2 MMT versus 22.0 MMT), although their view is a bit lower on Europe (150 MMT versus 150.3 MMT). Separately, MDA CropCast cut their forecast for the world wheat crop by 1.37 MMT from a week ago to 712.3 MMT, due to El Nino related losses in China. A Bloomberg survey of 34 traders and analysts in the US, Europe and Asia found 17 to be bullish on wheat prices, 11 bearish and 6 neutral. 21/05/15 -- Fads, remember them? Tank tops, flares, skateboards, the mullet haircut, shops where little fish nibble at your feet, the bioethanol industry. Who on earth thought any of that crazy lot had any longevity in them? Boy how we laughed at the hapless Americans when they virtually "gave away" Ensus to the Germans. A plant that had cost what, anywhere from GBP250-300 million to build sold for little more than GBP10 million. The muppets. Suddenly that doesn't look quite like such bad business though does it? Now the site looks set to remain closed for some time (see: That's a lot of mothballs). Meanwhile, down the road BP appear to have decided that bioethanol production isn't their really bag, and have sold their 47% stake in Vivergo to ABF, who now own 94% of it. I wonder what they'll do with the cash (assuming that there is any)? 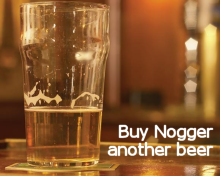 They could do worse than open up a chain of them e-cigarette shops, I reckon. 20/05/15 -- Soycomplex: Beans closed lower, setting fresh contract lows in many positions. Good planting progress and a "warm and wet" US weather forecast keep the pressure to the downside. The strong US dollar isn't helping either. The Argentine Ag Ministry estimated growers there to be 35.6% sold on their 2014/15 soybeans, up from 30% sold this time last year. Chinese cash soymeal prices are said to be near a 5 year low, which could keep a lid on their bean imports. The trade is expecting weekly export sales tomorrow to be 100,000–250,000 MT on old crop and 150,000–350,000 MT on new crop beans, according to Benson Quinn. It will be interesting to see if they manage to come in at those levels, given the recent resurgence of the US dollar. Sales last week came in at 136,600 MT on old crop and only a modest 88,000 MT on the new crop. The old crop sale of 132,000 MT of soybeans for delivery to China reported on Tuesday is only likely to show up in next week's report. The new crop soybean:corn price ratio ended the day at 2.44:1 versus 2.43:1 yesterday. Jul 15 Soybeans closed at $9.41 1/4, down 5 cents; Nov 15 Soybeans closed at $9.19 3/4, down 3 3/4 cents; Jul 15 Soybean Meal closed at $304.50, down $2.60; Jul 15 Soybean Oil closed at 32.20, up 2 points. Corn: The corn market closed around 2-3 cents lower. The same factors that are grinding soybean prices lower also apply to corn: excellent planting progress, largely ideal weather conditions, and the firm US dollar. "The first national crop ratings report is expected next week. Initial estimates are anticipating reported ratings near record high levels," said Benson Quinn. "The US Climate Prediction Centre now predicts an 80% chance of a full-fledged El Nino in the summer months. Very heavy Midwest rainfall is associated with the El Nino in summer. The last time the El Nino signal was this strong was in the summer of 2009 a year in which the US corn yield excelled, finishing 8% above trend. Another El Nino in the summer of 2004 promoted an even higher corn yield 13% above trend," said Martell Crop Projections. The Argentine Ag Ministry estimated growers there to be 44.8% sold on their 2014/15 corn, up from 36.2% sold this time last year. The weekly ethanol grind from the US Energy Dept was friendly, coming in at 958,000 barrels/day, a sharp jump from 912,000 bpd the previous week. 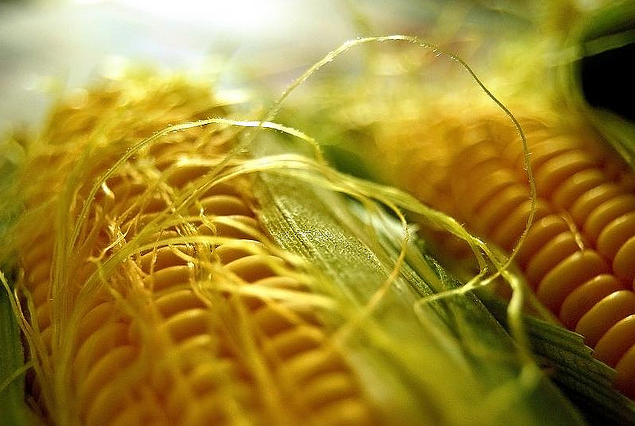 South Korea's Kocopia tendered for 55,000 MT of optional origin corn. Trade forecasts for tomorrow's weekly export sales report are at 400,000–600,000 MT on old crop, and 50,000–200,000 MT new crop Jul 15 Corn closed at $3.60, down 2 cents; Dec 15 Corn closed at $3.77 1/4, down 3 cents. Wheat: The wheat market closed mostly a little higher. Extreme wetness continues to hit winter wheat that's ready for harvesting on the Plains. Oklahoma City has already had its second wettest May on record, with more than 10 days of the month still left to go, picking up almost 14 inches of rain so far this month. Ditto Lincoln, Nebraska with over 10 inches. US spring wheat hasn't got off to a great start in some states either. "North Dakota received 2-4 times the normal rainfall in the past 10 days, capped off by a hard freeze May 18th and 19th. Approximately half of the state’s spring wheat had sprouted and emerged, when freezing temperatures developed," said Martell Crop Projections. The suddenly warmer forecast will be most welcomed there. Both the Ukraine and Russian Ag Ministries remain bullish on their crop production prospects this year. Ukraine today raised their 2015 grain crop forecast by 2 MMT to 60 MMT, with wheat up 1 MMT to 21 MMT. Russia are standing firm at a 100 MMT grain crop despite spring planting delays. The Argentine Ag Ministry estimated growers there to be 73.8% sold on their 2014/15 wheat, up from 51.7% sold this time last year. Trade estimates for tomorrow's weekly export sales are zero on old crop and maybe 300,000-400,000 TMT on new crop. Sep 15 CBOT Wheat closed at $5.20, up 1 1/2 cents; Sep 15 KCBT Wheat closed at $5.55, up 4 1/2 cents; Sep 15 MGEX Wheat closed at $5.78 3/4, up 3 1/4 cents. 20/05/15 -- EU grains closed mixed with May 15 London wheat down GBP0.35/tonne at GBP109.70/tonne, Sep 15 Paris wheat was EUR2.25/tonne firmer at EUR180.50/tonne, Jun 15 Paris corn was down EUR0.75/tonne at EUR154.00/tonne and Aug 15 Paris rapeseed rose EUR2.00/tonne to EUR359.75/tonne. Fresh news of any great note was thin on the ground. Many traders are keeping an eye on developments in Russia, where spring plantings are behind schedule and hot and dry weather is in the 7-14 day forecast. Agritel said that by Jun 1 temperatures could hit "around 30°C in Ukraine and middle of Russia and over 30° in Southern Russia." These would be record levels for so early in the year, they say. 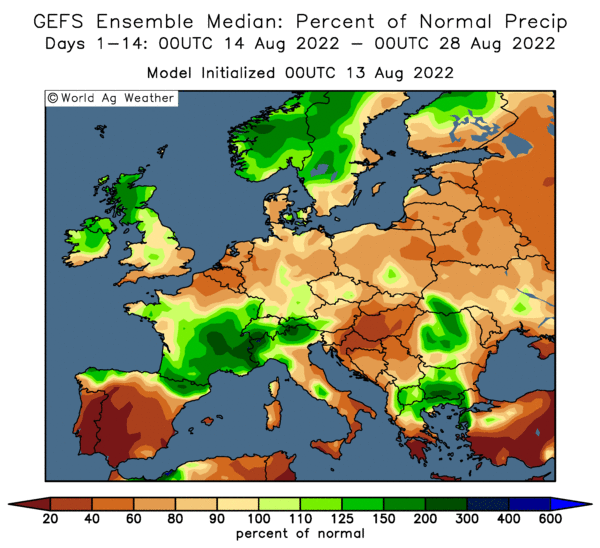 Rainfall is also in line to be below normal in the southern, central and Volga regions of Russia along with eastern parts of Ukraine, according to the latest forecasts. Undeterred, the new Russian Agriculture Minister Alexander Tkachev is standing by his estimate for a 2015 grain crop of 100 MMT. That's only down a little on the 105.3 MMT produced last season, although he did add the caveat "provided funding isn’t cut" to his forecast. Russian business daily newspaper Vermosti says that the Russian Agriculture Bank has asked the state for an additional 35 billion roubles (around $700 million) to provide loans to help fund spring planting. The newspaper story suggests than only 5 billion roubles of this extra funding is likely to be forthcoming from the government. Spring grains in Russia have officially been planted on 18.8 million ha so far, down from 21.1 million this time a year ago. That's a little over 60% of the Ag Ministry forecast, and includes 6.0 million ha of wheat (45.7% of forecast), 6.1 million ha of barley (74.9%) and 2.3 million ha of corn (83.7%). The Russian government intervention fund picked up a little under 14,000 MT of grain in today's purchase round, taking the total bought so far to around 910 TMT. Most of that was so-called grade 3 wheat at RUB9,925/tonne, which is the equivalent of around $199/tonne. 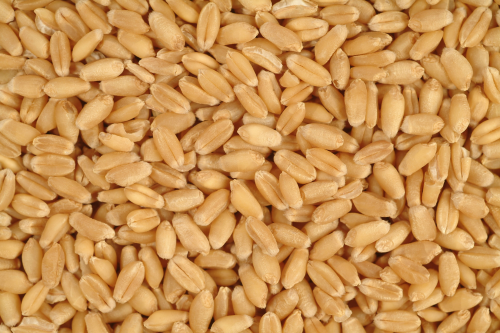 New crop 12.5% Russian milling wheat is said to be offered around the $180-185/tonne region FOB the Black Sea. The Russian Ministry said that the country's May 1 grain reserves stood at 19.1 MMT, a 21% increase on a year previously. In Ukraine, their Ag Ministry are as similarly bullish on 2015 crop production prospects as their Russian "friends" this year, raising their estimate for total grain production by 2 MMT to 60 MMT, which again isn't down too much on last year's output of 63.8 MMT. Wheat will account for 21 MMT of that total, they say, up 1 MMT from their previous forecast. Winter crop development is around 3-5 days ahead of normal development, they say. They say that the country has now exported 30.8 MMT of grains this season, including 15.9 MMT of corn, 10.3 MMT of wheat and 4.4 MMT of barley. The Ministry of Economic Development forecast full season Ukraine grain exports at 36.76 MMT, including 20 MMT of corn, 11.6 MMT of wheat and 4.4 MMT of barley. Ukraine farmers have planted 6.5 million ha of spring grains, out of a government forecast of 7.0 million, they added. That total includes 4.1 million ha of corn, they said. Bulgaria said that they'd exported 6.36 MMT of grains this season (to May 1), including 2.88 MMT of wheat, 1.74 MMT of corn and 0.55 MMT of barley. Algeria tendered for 50,000 MT of optional origin wheat for August shipment. 19/05/15 -- Soycomplex: Beans closed lower, with new crop Nov 15 posting a lifetime contract low. US plantings are going well, the Midwest has had plenty of moisture, and a warmer forecast for next week should be just what newly planted beans need. With corn planting already winding sown, bean sowings might also move it up a notch this week, it is thought. The usual Monday weekly export inspections numbers were delayed due to "technical difficulties" yesterday. The USDA released them today instead, and for beans they came in at 341,097 MT - a respectable total given the time of year and the large volume of old crop already exported. To add a bit more support to the old crop picture the USDA also today reported 132,000 MT of US beans sold to China for 2014/15 delivery. China's CNGOIC said that soybean production there will fall for the fifth season in a row this year, down 7% to 11.2 MMT. Ongoing strikes in Argentina should be a little supportive, but the sharply firmer US dollar isn't. Jul 15 Soybeans closed at $9.46 1/4, down 8 1/4 cents; Nov 15 Soybeans closed at $9.23 1/2, down 11 1/2 cents; Jul 15 Soybean Meal closed at $307.10, down $0.90; Jul 15 Soybean Oil closed at 32.18, down 60 points. Corn: The corn market closed around 5-6 cents easier. Lower wheat prices didn't offer any support, and neither did the higher US dollar. Weekly export inspections of 1.1 MMT were pretty decent though. Fund money was given credit for being a net seller of around 6-7,000 lots on the day. "They are plenty short the market, but I don’t see a catalyst to move them off their short position at this point. It would take a weather scare, which certainly isn’t imminent right now," said Benson Quinn. 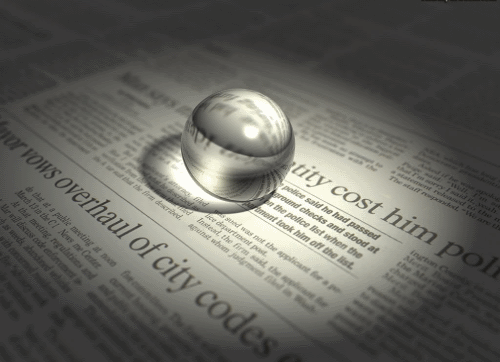 Lower crude oil prices were another negative today, so too is the US bird flu epidemic. Low US DDGs prices could also be impacting on feed demand for US corn, it is said. Russia said that it's 2015 corn crop was 82% planted on 2.3 million ha, which is 0.1 million higher than this time last year. Germany's 2015 corn area was estimated marginally higher than a year ago at 482k ha, according to their Stats Office. DRV estimated Germany's corn crop at 4,83 MMT, a 6.1% decline on a year ago however. FranceAgriMer pegged French corn plantings at 1.64 million ha, a 6.4% fall versus last year. Jul 15 Corn closed at $3.62, down 6 cents; Sep 15 Corn closed at $3.69 1/4, down 6 cents. The new crop soybean:corn price ratio closed at 2.43:1 tonight, which is around the middle of the recent range. Wheat: The wheat market closed sharply lower in "Turnaround Tuesday" style. A sharply higher US dollar was probably the catalyst, as heavy rains continue to be in the forecast for the US Plains. Maybe the fact that the USDA raised good to excellent wheat crop ratings last night was also another bearish influence today. Weekly export inspections of 309,562 MT were in line with what we've been used to recently, if not very inspiring. The marketing year is almost over for US wheat, and a couple of strong weeks are needed to stand a chance of hitting USDA targets for the season. Russian spring wheat is 42% planted on 5.6 million ha, which is 1.1 million less than this time last year. Kazakhstan's spring grains are 8.8% planted on 1.28 million ha. The German Stats Office estimated the winter wheat area there up 3% at 3.25 million ha. Germany's DRV increased their forecast for the 2015 German soft wheat crop by more than 1 MMT to nearly 27.8 MMT, although that's still 3% down on a year ago. FranceAgriMer raised their forecast for French winter wheat plantings to 5.16 million ha, up 3.3% on last year. Oman bought 60,000 MT of Russian 12.5% milling wheat in a tender at levels said to be at least $30/tonne below US offered levels. Jul 15 CBOT Wheat closed at $5.10 1/4, down 11 1/2 cents; Jul 15 KCBT Wheat closed at $5.40, down 15 cents; Jul 15 MGEX Wheat closed at $5.64 1/4, down 10 1/4 cents. 19/05/15 -- EU wheat gave up some of yesterday's gains, as US futures turned lower despite ongoing concerns over rains pounding US winter wheat on the Southern Plains. At the finish, May 15 London wheat was down GBP1.30/tonne at GBP110.05/tonne, Sep 15 Paris wheat ended EUR1.75/tonne lower at EUR178.25/tonne, Jun 15 Paris corn fell EUR0.50/tonne to EUR154.75/tonne whilst Aug 15 Paris rapeseed rose EUR2.00/tonne to close at EUR357.75/tonne. The pound was under pressure on news that UK CPI inflation had slipped below zero for the first time on record. The euro however fared even worse on ideas that the ECB might be forced to increase QE in the near future. FranceAgriMer raised their forecast for French soft wheat plantings to 5.17 million ha, up 3.3% from 5.01 million ha a year ago. That's now more or less in line with the French Ag Ministry's figure of 5.18 million ha, which is the largest since 1936. 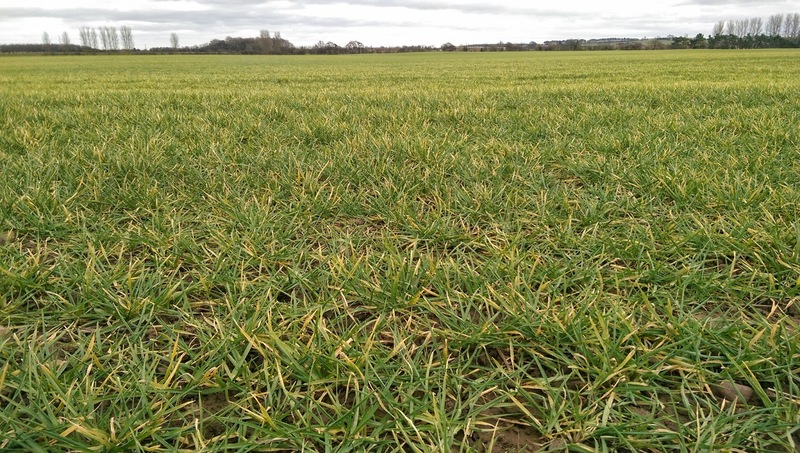 FranceAgriMer estimated the French winter barley area at 1.28 million ha, up 4.3%, some of that increase came at the expense of spring barley plantings which were pegged 11% lower at 467k ha this year. That's an all barley area of 1.75 million ha versus an Ag Ministry figure of 1.71 million ha. French corn plantings were estimated down 6.4% at 1.64 million ha by FranceAgriMer, a little lower than the Ministry's figure of 1.71 million. The former also put rapeseed sowings 1.9% lower this year at 1.48 million ha. The German Stats Office meanwhile forecast winter wheat plantings there up 3% at 3.25 million ha, with the German winter barley area also up 3% at 1.27 million ha. 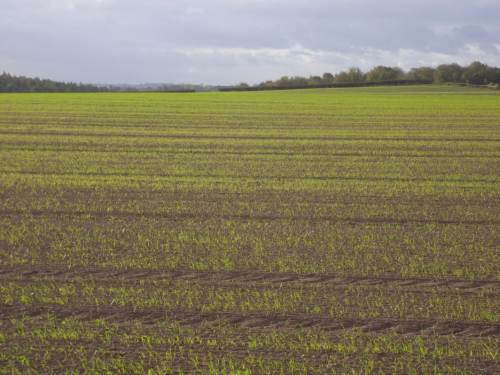 Winter rapeseed plantings there are down 6.4% at 1.3 million ha, they added. Germany's DRV meanwhile forecast the country's winter wheat crop at 27.78 MMT, up more than 1 MMT from a month ago due to "continued cool and rainy weather". German barley production was estimated down 5.4% at 10.94 MMT, with winter rapeseed output falling 16% to 5.23 MMT, and the 2015 German corn crop is seen 6.1% lower at 4.83 MMT. Agritel forecast the Ukraine barley crop at 6.9 MMT, down almost 27% on 9.4 MMT a year ago, although above the USDA's recent 6.2 MMT prediction. They see OSR output there at 1.8 MMT, a more than 14% drop on a year ago and a little below the USDA's estimate of 2.0 MMT. UkrAgroConsult estimated Ukraine's 2015 wheat crop at 22 MMT, up 1 MMT from previously on recent beneficial rains. That's now only 0.5 MMT below last year's production. Wheat exports in 2015/16 were pegged at 12 MMT, up from their previous forecast of 10.8 MMT. Exports this season currently stand at 10.2 MMT, and might reach close to 11 MMT by the end of the campaign. Spring planting progress in Russia remains behind schedule, with 18.2 million ha sown so far, according to the Ag Ministry there. That's 58.6% of the government forecast and 2.3 million ha less than this time last year. Russian spring wheat is 42.3% sown on 5.6 million ha (versus 6.7 million ha a year ago), spring barley is 73.6% sown on 6.0 million ha (7.0 million a year ago) and corn planting is 82.1% done on 2.3 million ha (versus 2.2 million a year ago), they say. Agritel forecast the Russian 2015 barley crop at 16.4 MMT, a 12.8% decline on 18.8 MMT a year ago, and slightly below the USDA's 16.5 MMT estimate. 18/05/15 -- Soycomplex: Beans closed with small gains. Oil World estimated global 2014/15 soybean ending stocks at an ample 87.7 MMT, which would take total soybean availability in 2015/16 to a plentiful 399 MMT, they said. The USDA estimated that 45% of the US 2015 soybean crop was now in the ground, in line with trade forecasts. That was up 14 points on a week ago and this time last year, and also 9 points ahead of the 5-year average. Emergence was placed at 13% versus 8% a year ago and 12% for the 5-year average. Argentine labour disputes remain a positive, although it's unclear how much, if any, business is being redirected to the US. The expanding bird flu epidemic in the US is a negative. So too is a firmer US dollar. Jul 15 Soybeans closed at $9.54 1/2, up 1 1/4 cents; Nov 15 Soybeans closed at $9.35, up 1/2 cent; Jul 15 Soybean Meal closed at $308.00, up $4.70; Jul 15 Soybean Oil closed at 32.78, down 29 points. Corn: The corn market closed around 2-3 cents firmer. The USDA pegged corn plantings at 85% complete, up 10 points on a week ago and the 5-year average. Emergence is at 56% versus 29% a week ago, 32% a year ago and 40% for the 5-year average. All that was pretty much in line with expectations. US weather remains generally non threatening, although there's some talk of frost for one or two areas damage is likely to be very limited. Wheat was supportive for corn today too. South Korea bought 63 TMT of optional origin corn for Oct/Dec shipment over the weekend. The Ukraine Stat Stats Service estimate May 1 corn stocks there at 6.8 MMT. APK Inform said that Ukraine's corn exports via seaports fell to only 85.9 TMT last week. Russia said that it's season to date corn exports were down from 3.72 MMT a year ago to 2.54 MMT. AgroInfoMarket cut their forecast for Spanish corn production this year to 10.81 MMT and raised their estimate for corn imports by 200 TMT to 5.95 MMT, of which 2.1 MMT will come from Ukraine and 1.4 MMT from France, they predict. Jul 15 Corn closed at $3.68, up 2 1/2 cents; Dec 15 Corn closed at $3.85 3/4, up 3 cents. Wheat: The wheat market closed with double digit gains as heavy rains pounding the Southern Plains sparked some short-covering. Fund money was still short over 100k lots in Chicago wheat as of Tuesday night, Friday's Commitment of Traders report revealed. India's wheat imports may jump to as much as 2 MT in 2015/16 from only 45,000 MT a year previously as millers there seek better quality material to blend in with their own rain damaged crop, according to a report on Bloomberg. There's talk of a hot and dry pattern developing for Russian wheat, which is adding to market jitters, although it's not really here yet. The USDA raised US winter wheat crop conditions by 1% in the good to excellent category to 45%, much better than only 29% a year ago. They said that 68% of the crop is headed versus 55% a year ago and 56% for the 5-year average. Spring wheat planting has now advanced to 94% done versus only 65% on average. Spring wheat emergence is at 67% versus only 38% on average. South Korea bought 90 TMT of Australian hard wheat for October shipment over the weekend. Sep 15 CBOT Wheat closed at $5.29 1/4, up 11 3/4 cents; Sep 15 KCBT Wheat closed at $5.64 1/2, up 13 1/4 cents; Sep 15 MGEX Wheat closed at $5.86, up 13 1/4 cents. 18/05/15 -- EU grains began the week trading higher across the board, with wheat posting the biggest gains on what was probably a combination of nervous short-covering and bargain hunting. The day ended with May 15 London wheat up GBP3.25/tonne at GBP111.35/tonne, Sep 15 Paris wheat jumped EUR5.50/tonne higher to EUR180.00/tonne, Jun 15 Paris corn gained EUR0.75/tonne to EUR155.25/tonne whilst Aug 15 Paris rapeseed was up EUR2.00/tonne to close at EUR355.75/tonne. Fears that heavy and untimely rains on the US Southern Plains - linked to the developing El Nino - could be causing some crop damage, was one reason for the rally. That got the heavily short fund money spooked. "At least 4 inches but 6-8 inches of rain, locally, developed in Texas, Oklahoma and southern Kansas the past 2 weeks This amounts to s 5-6 times the normal rainfall in an area known for its dry climate. Talk that Russia could be in for a hot and dry spell not too far down the line has also ruffled a few feathers. Spring planting there is only 55% complete on 17.1 million ha, which is 1.9 million ha less than a year ago. Showing signs of nerves that all was not going as well as hoped for, the new Russian Ag Minister has said that regional authorities should make every effort to increase the pace of spring planting - in particular Siberia and the North West Federal District. 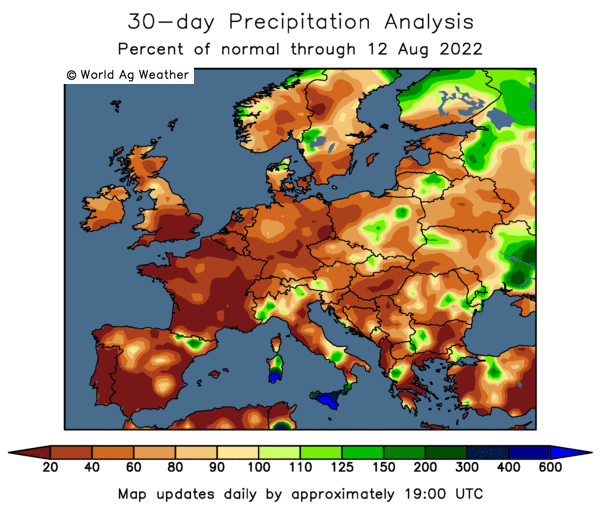 Rainfall is likely to be sparse for wheat in the former Soviet Union in next 10 days, according to the Commodity Weather Group. Moisture stress could start to build in Southern Russia by the end of the month, although Ukraine may get some rain next week, they add. Meanwhile "there are growing indications of a significant warm-up that is going to take place over the Volga and Southern districts of western and central Russia over the next 2-5 weeks," said WxRisk.com. The Russian Ag Ministry said that the nation's wheat exports were down 60% from a year ago at 1.61 MMT since the Feb 1 wheat export duty came into force. Even so, season to date exports of wheat are still up 16% at 20.08 MMT. The market is expecting that this figure could be 21.0-21.5 MMT by the end of the season. Spanish analysts AgroInfoMarket trimmed their forecast for the country's soft wheat crop from 6.19 MMT to 5.75 MMT, although that's still up 2.9% on output of 5.59 MMT a year ago. They also reduced their forecast for Spanish barley production by almost a million tonnes, down from 8.34 MMT to 7.39 MMT, although again that's better than the 6.74 MMT produced in 2014. Adverse weather conditions in recent weeks was the reason given for the production cuts, and they said that further damage could be caused if the current heatwave persists. Temperatures topped 40C in many parts of Spain last week, breaking records for the month. State broadcaster TVE said some estimates calculated agricultural losses could exceed 50 million euros due to the scorching heat. For now though, AgroInfoMarket left their estimate for Spanish soft wheat imports unchanged from last month at 3.31 MMT, but they raised their view on corn imports by 200 TMT to 5.95 MMT and doubled their estimate for barley imports to 500 TMT. The USDA's FAS in Saudi Arabia estimated the country's 2015/16 barley imports to fall slightly, down 200 TMT to 6.8 MMT, with the nation importing more wheat and corn. Wheat imports are seen rising 300 TMT to 3.8 MMT and corn imports expected to increase 1 MMT to 4.45 MMT. The stronger US dollar was a supportive factor for both London and Paris wheat today. Barclays forecast the US currency beating sterling down to 1.39 in Q3 of 2015, and 1.36 by Q1 of next year. The euro meanwhile will dip to parity in Q3 and below it to 0.98 versus the dollar by the end of the year, they predict. 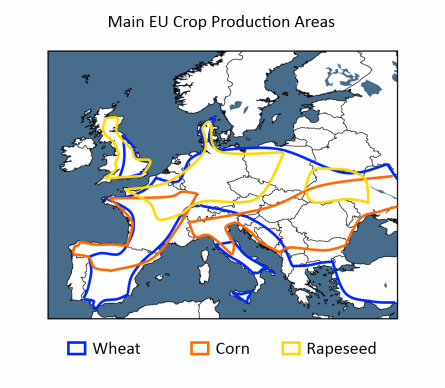 Both events would be friendly for exports, and potentially grain prices here in Europe, if they are correct. The only red on the board relates to lower values for the pound and euro against the US dollar - are Barclays right (see story below)?? This morning I read that the new Russian Ag Minister is saying that regional authorities should make every effort to increase the pace of spring planting - in particular Siberia (only 17% sown) and the North West Federal District (36% planted). 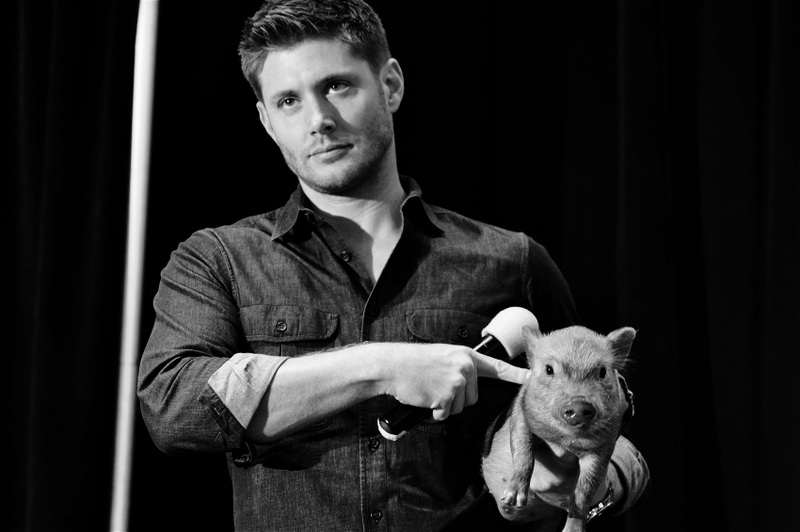 Getting twitchy? Russia's season to date exports are still up 18.4% at more than 28 MMT, including 16% more wheat (20.08 MMT). APK Inform say that Ukraine seaports only shipped 132.7 TMT of grains last week, down sharply from 496.5 MMT the previous week. Barley exports via seaports last week were nil, backing up the theory that these are just about done. Corn exports were 85,900 MT and wheat shipments were 46,800 MT, they say. The Ukraine State Stas Service say that the country's May 1 grain stocks were 12.9 MMT, including 6.8 MMT of corn, 4.6 MMT of wheat and 1.0 MMT of barley. Canada says that it has exported 12.7 MMT of wheat (excluding durum) so far, in a season which now has only 12 weeks left to go. That's a 5% increase on a year ago. Canada has also exported 17% more durum wheat than a year ago (4.0 MMT) and 3% more canola (6.7 MMT). Two separate South Korean companies are reported to have bought 45,000 MT each of Australian hard wheat over the weekend for October shipment. Another South Korean buyer has purchased 63,000 MT of optional origin corn for Oct/Dec shipment. The Brazilian government have increased the minimum support price that they will pay for wheat by 4.6%, but growers say that this is still below the cost of production which is said to be up 14%. 18/05/15 -- Current pound strength against the US dollar isn't expected to last long, according to Barclays. 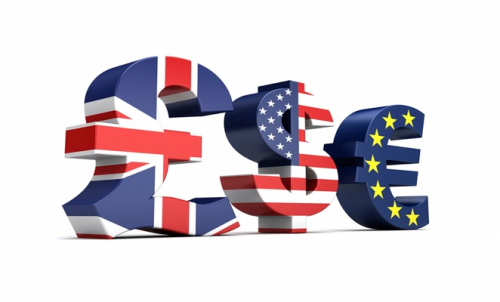 Last week's push to a 6-month high of over 1.58, following the surprise Conservative majority in the General Election, will be short-lived and the greenback will soon assert its superiority over both sterling and the euro, they predict. Despite the pound hitting its highest against the US currency since November last week, they forecast a sharp drop to only 1.39 in the next quarter (down 11% from where we are currently), falling to 1.38 in Q4 and 1.36 in Q1 of 2016. The euro is likely to perform even worse. Barclays say "we believe that the EUR has much further to go in its trend depreciation, albeit at a slower pace and with higher two-way risks attached. Moreover, we still think the EUR faces risks from a prolonged period of Greek political uncertainty." The euro has recently risen close to 1.15 against the dollar - it's best level since early February - but that won't last long, with a fall to parity on the cards in Q3 of 2015 (a 13% decline), and the single currency seen dipping below that level in Q4 (0.98) and again in Q1 of next year (0.95). The pound will still continue its trend of modest appreciation versus the euro, rising above the 1.40 level that has proven to be a difficult nut to crack, in Q4 and hitting 1.43 in Q1 of 2016 for a near 4% increase on where we are today, they estimate. The forecasts given for the pound seem pretty bearish in particular to me, but IF they are proven correct then they could add some support to London wheat. The outlook for the euro I can buy into more easily, which would certainly continue to boost EU wheat exports in 2015/16, and again help underpin Paris wheat. All this won't help US wheat exports though, if it comes true, and it could certainly be construed as outright bearish for US corn and soybeans given current planting progress figures and the forecast for a non-threatening El Nino-linked summer.